Shaping the coilform at 30,000 rpm with a grinding burr being driven by the Foredom die grinding tool. 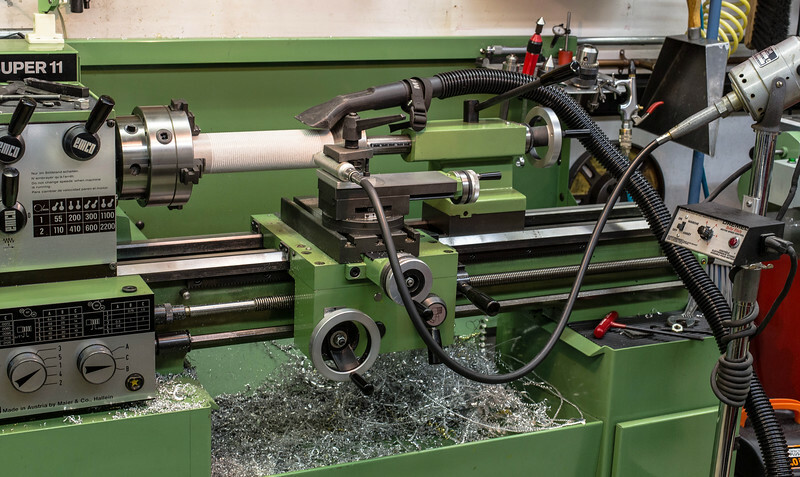 The lathe is being run at a more sedate speed of 55 rpm while the wire recess is being cut (ground) into place on the coilform, through the action of the grinding burr mounted in the handpiece, and clamped in place of the toolpost assembly on the compound slide. If you are wondering why I just don't use conventional tread cutting means to cut the thread form, its due to the fact that the coliform is fiberglass, and trying to cut it using conventional means, would not make a clean cut in the fiberglass..